LED market is fermented, a weak overall market, whether the LED market is entering a bottleneck, the parties argue a lot view. Can someone seems to see more. And, the answer is to be used practices. This person is LI Jian-sheng, Shanghai Science and Technology Co., Ltd. CDH founder and CEO - Shanghai Semiconductor Lighting Engineering Association and vice president. 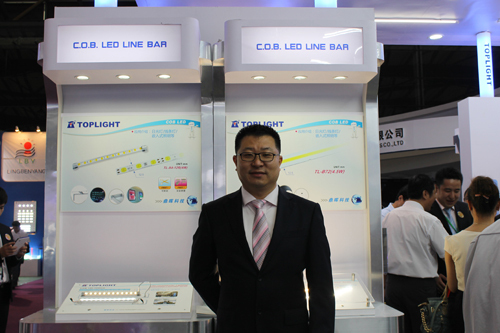 In four days in 2012 Shanghai International Lighting Fair, LI Jian-sheng will be at the show, because in LED development process of marketing has become one of the essential content. LED's in the development process, from the initial highbrow tech products, developed to cheaper prices, more and more high-brightness light effect, making the current field of LED two extreme points of getting smaller, from power, expensive, high luminous efficiency, relative power, relatively cheap, high light efficiency of these products are not part of the standard luminous efficiency, luminous efficiency standard product belongs to the people easily accepted, LED really want "the people" must be be cheap. But the development of each product to market to mature is a corresponding development cycle, of which there are some strong government advocacy and promotion, but LI Jian-sheng stressed that the low prices in the LED industry is not necessarily a good thing. If you paid attention to the "promotion", that is the inevitable result of the decline in the quality of products, which will lead to vicious competition in the market, especially as this requires long-term use of LED products, not short-term can identify their quality, which also professionals need to detect, so that the LED products, "R & D" and "promotion" must grasping with both hands. Shanghai Toplite Technology Co., Ltd. is specialized in LED lighting applications, device packaging and providing technical services of high-tech enterprises, currently COB integrated light source packaging as the main products. Toplite is very lucky, overall operating situation is now very good, and a few years before we have completed many large projects, from a strategic perspective, the market focus is the core point of Jiangsu, Zhejiang region to the country to emit radiation in the world. At present, we have a very noticeable achievements in Jiangsu, Zhejiang, Shanghai Yan'an Road, the main highway landscape lighting (within the range of 14,000 kilometers, more than 30 million units selected LED), Nanpu Bridge (LED lighting project using CDH high power RGB devices), Suzhou River bridges (18 bridges using CDH technology LED lighting devices) and so on. In addition, LI Jian-sheng stressed, launched in 2009 COB LED current use of buses in Shanghai has more than 9,000 buses in the car, has not received any adverse complaints. 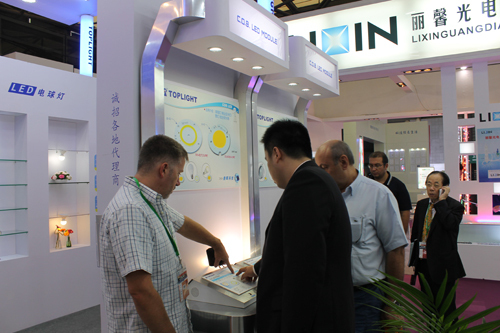 In the course of the show, LI Jian-sheng spoke bulb is currently the most widely used in daily life the amount of light species, Toplite technology still in the process of the show introduced a bulb specifically for the design, very unique LED bulb COB light source lamp, this LED light bulb designed to take full account of the problem of heat dissipation, the LED clever combination of high and only light source that is synchronized on the heat problem solved, so as to control the cost of cooling fundamentally, that control the overall cost of the final price of the lamp. LI Jian-sheng electronic engineering from Fudan University, for research in LED technology he talked about: "a professional perspective Toplite joint Shanghai Fudan University, State Key Laboratory of Shanghai University of LED reality technology to produce high reliability LED related products to high quality and reliability as the core competitiveness. " Speaking about the future prospects of LED, LI Jian-sheng said, LED green, energy efficient LED industry will increasingly brighter, but as Toplite people, but also determined to reduce carbon emissions worldwide contribute to the cause. Toplite Technology Co., Ltd. is specialized in LED lighting application device package and provides technical services of high-tech enterprises to pursue high-quality reliable LED lighting products known. Commitments Ministry of Science and Technology Research and Development Program (863 Program) LED research and development topics as well as a number of Shanghai-class LED R & D projects, the Shanghai Science and Technology little giant enterprises, one of the major LED manufacturers. Copyright © TopLite 1996-2013. All rights reserved.